The Product Development Team and Team Losi Racing Team has been constantly testing over the summer and found there to be some substantial performance advantages when adding weight to the front end of the 22 2wd vehicles on very high grip surfaces like carpet of Astro Turf. When adding the 50g Brass pivot to the 22 2wd vehicle, the additional weight on the front provides more steering low speed, and more stability high speeds since the weight transfer is not as extreme (the front end is already loaded). 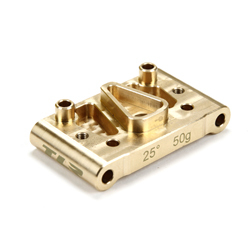 The Brass pivot fits with no other parts requires, and does NOT use the front hinge pin brace used with the standard pivots (to make it as heavy as possible).